The Rug Doctor brand is well-respected and recognized for offering high quality rental and professional-grade carpet cleaners for home users. Like the classic Rug Doctor carpet cleaner, new Rug Doctor Portable Spot Cleaner (also known as Rug Doctor 93300 Series) is built to high quality workmanship standards and cleans powerfully. It is easy to use right out of the box (no assembly required) and demonstrates effective deep cleaning results. 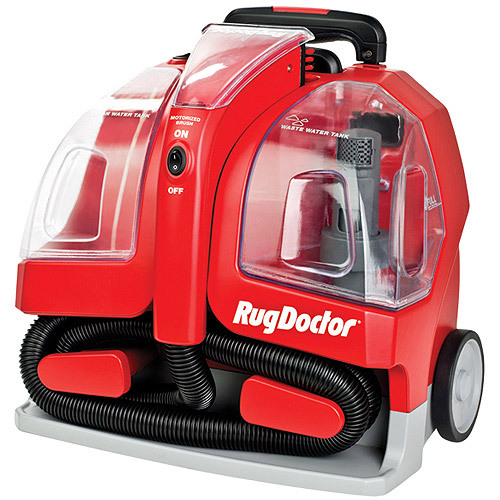 It’s the perfect compact and lightweight companion to using the larger Rug Doctor – for cleaning up ongoing spots, stains and spills when it would too much of a hassle to bring out the larger machine or go out to rent out. 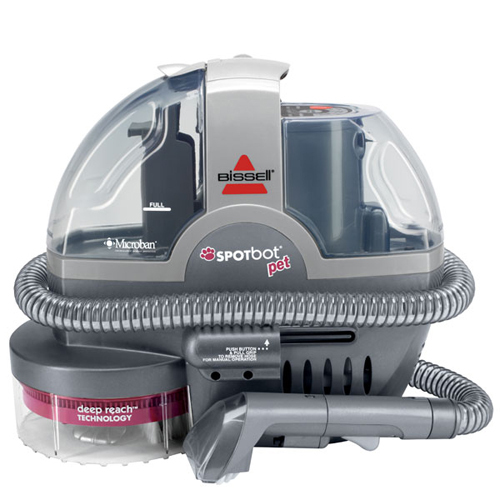 The Bissell Spotbot Pet Deep Cleaner 33N8/ 33N8A takes carpet spots and stains cleaning to a whole new level by offering an automated smart cleaning system. Users can set this portable unit over a stain, pick a scrubbing mode, and walk off while this little worker automatically cleans the stain off. It also has a manual cleaning mode, which operates similarly to any portable carpet cleaner – with a hose attachment and scrub brush handtool. 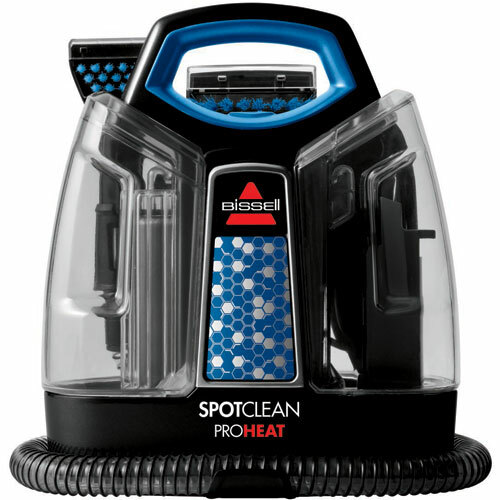 This makes the Spotbot portable cleaner useful for cleaning upholstery and auto interiors as well, besides clearing out regular carpet stains or pet messes. The Bissell Little Green 1400 portable carpet cleaner machine is a proven spot remover model that has been around for over a decade. It has lots of fans. Users love how well it cleans and how easy it is to use. The Bissell Little Green is perfect for those times when you just need to pick up the spots and stains quickly. The “Green” in the machine is because it is uses at least 50% recycled materials to build. The Bissell Little Green may be an older model, but it cleans extremely well and has stood the test of time. The only complaint, as pointed out by a few users, seems to be that debris can collect in the dirty water tank, and it’s hard to clean out. 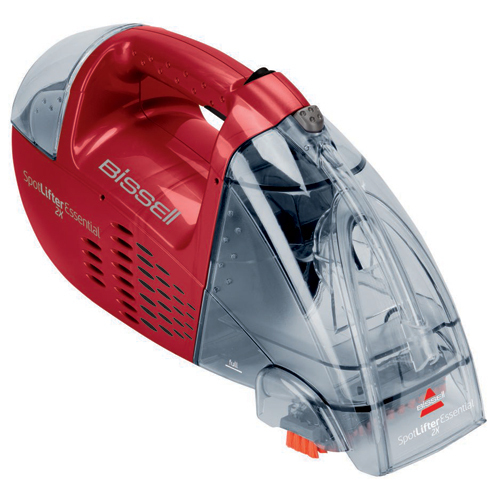 If you are concerned about that, the Bissell Spot Clean Pro 3624 or Bissell SpotClean Portable Carpet Cleaner 5207 in comparison do not have the same complaints against them. 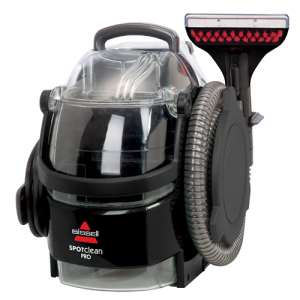 The Bissell SpotClean Portable Carpet Cleaner 5207 is more compact, lighter in weight and less costly than the Bissell SpotClean Professional 3624, Bissell SpotBot Pet or Rug Doctor Portable spot cleaner; yet it packs a lot of cleaning power into it’s small frame. With ample power and good engineering, the SpotClean Portable is able to quickly remove stains collected over time from pets, spills and more, with ease. Besides household carpet spot cleaning and dealing with pet messes, this machine is frequently purchased for cleaning auto carpets and upholstery as well. The Bissell SpotClean Portable Carpet Cleaner is recommended for users who like a mid-range but still high quality carpet cleaner that will quickly remove stains. It’s also a great choice for users who may need to frequently clean out hard to reach areas or old embedded stains since it comes with two related tool attachments that target these. In addition, the cleaner comes with useful features like HeatWave Technology to keep water temperature constant and removable water tanks for easy cleaning. 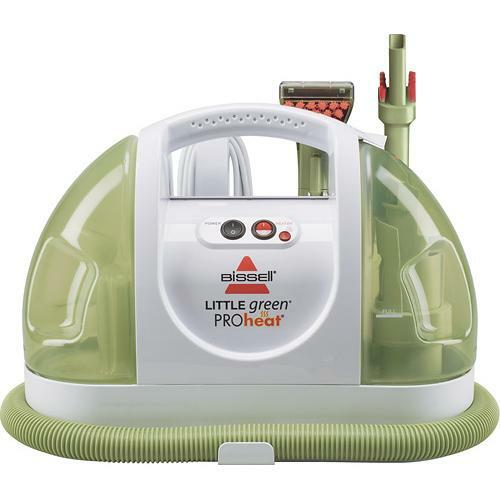 The Bissell Little Green ProHeat carpet cleaner is the only compact carpet cleaner that comes with a heating feature. It heats water up to 25 degrees F higher. Cleaning with hot water is always better as heats helps to get the dirt particles out. The internal heater feature offers extra convenience to users who do not need to wait for tap water to heat up, or be worried that the water cools off before they are done with their cleaning. The Bissell SpotLifter 2X Portable Deep Carpet Cleaner 1719 is a lightweight cordless handheld cleaner that makes it very easy to lift and clean off fresh stains before they have a chance to set-in. The machine is lightweight and cordless, which means you don’t even need to plug it in to get started with the cleaning. It is also small enough to be kept in a convenient space where it can be quickly assessed and put into action. See Best Handheld Carpet Cleaners guide. If you are looking for a great machine that is lightweight and easy to carry around, consider the portable carpet cleaning machines reviewed above. If you are looking for regular upright cleaners to efficiently clean whole rooms rather than spots, check out the carpet cleaning machines reviews homepage for more information. To compare these two types of machines, check out this comparison chart and guide. A third choice is upright lightweight carpet cleaners. They are not built to clean spots as intensely as spot cleaners, but they are lightweight and can handle spots and stains, or whole area/small room cleaning. For a list of the various types of carpet cleaners (eg. upright, lightweight or portable), check out the carpet cleaning machines introduction guide.